Google Apps Settings Including Settings for Premium Google+ is not easy to tune especially if you are using another managed service like of Rackspace Cloud. And just take our instance – a simple farm to full fledged Private Company migration, 3 AdWords accounts eventually created, separate AdSense Account, one separate Google Display Network client account, one DFP account (thankfully there is no chance to get DFP without AdSense), 2 YouTube Accounts, 70+ domains, it will be over 100 if sub domains are calculated, I personally manage two edu and one ac website behalf of other, 80% Cloud Services are from managed The Rackspace Cloud, including emails except for this domain. Forget to add that I have all Google Services enabled, including books, scholars etc. It can happen that you are in the same situation, at least partially. As an owner (at least by thought, if not legally), you need to merge all somehow. Logically you will say – change all to that AdSense account’s one. But, that is not my named account, it is of my father (who is quite in ill health as I wrote in my personal blog). Add that – I am Google verified Author. I can not delete or forget that account. Most importantly, it is insecure to ask any of my employee to work on it, it is I have to setup first. The reason (again) for writing up this guide on Google Apps Settings Including Settings for Premium Google+ is, to decrease your pain as I needed to work at a stretch for 5 hours with quite experienced hand, and two laptops (one to plan properly !). Multiple YouTube Accounts – we wrote the process for Adding AdSense Account of Different Email with YouTube, you can not merge them. Rich Snippets and Organization of Schemas are quite important part of SEO, you probably do not want to see two clones of you on search result or divided Ranking. Third is AdSense, in our case it was no problem as it was one. Only adding the other (s) on that AdSense account (that is giving Administrative power or something like that) will work. But if you have two AdSense account, you must close one for legal reasons (Against Google’s policy, will increase your Income Tax return etc.). Forth is AdWords – it has no problem. Simply use the major one and stop the campaigns of the others after making the accounts depleted. Fifth is Webmaster, Analytics etc. – these can be managed in the same way like AdSense. Basically, for the most, these kind of pain for Google Apps Settings Including Settings for Premium Google+ is due to the fact that during Beta Testing of Google +, no one thought it would be so important. Our basic target is to create one named organization through Google Apps Settings Including Settings for Premium Google+ and add the others as different profiles. This is what actually Google also suggests as it creates problem for them to understand whom to contact with plus makes Google Merchant Center somewhat unusable. So, basically you will use some features of Google Cloud and some from another infrastructure provider (s), in our case it Rackspace and it is fact for the most (with same condition like us) it will be Rackspace due to lesser billing. If it is IBM or SAP, it will get more complicated. You have to follow my directed steps and modify your way. As basically all are Cloud based, there can be easy ways for branding, login, administration, management etc. In this part I will go only with the technical part for Google Apps Settings Including Settings for Premium Google+ with Google Apps for Business or Google Apps free one (was probably named as Google Apps for Domains) plus all other Hosting, Administration, Management services from Rackspace or their partners (for easy single sign on for the most). Google is also partner of Rackspace for Email solution. So I saw a light in the dense dark later. That however your choice to use. The Your Users is the place, for example to add your other websites or employees. Your Google Apps is clearly understandable. So fom the blue navigation bar, the first entry named Dashboard is somewhat explained, there are other widgets like Marketplace apps, Merchant Center etc. Second is Organization and Users. This is for managing Core Google Services as well as all other services plus managing the users. Third is Groups. Groups make it easier to communicate and collaborate. You can make the management work easier. 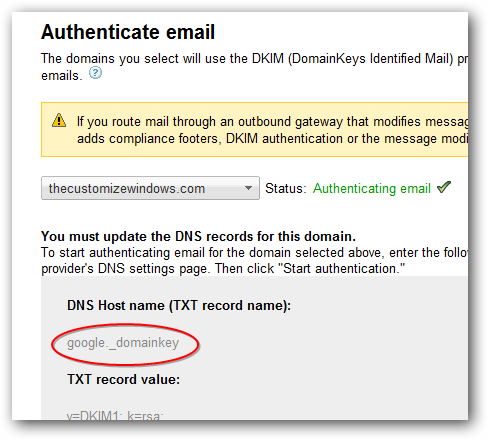 Copy that google._domainkey (circled with red line) name and create a DNS Record in Rackspace Control Panel as TXT (DNS Management > Click Add Record > Select TXT from dropdown) and then copy that very big TXT record value and paste in Rackspace’s TXT field and save it. Then authenticate from Google Apps panel. Now about Premium Google+ features. This will give you the liberty to keep handouts private. Other one important feature we will publish separately as it will need another 1200 words. This Article Has Been Shared 7962 Times! Cite this article as: Abhishek Ghosh, "Google Apps Settings Including Settings for Premium Google+," in The Customize Windows, October 22, 2012, April 20, 2019, https://thecustomizewindows.com/2012/10/google-apps-settings-including-settings-for-premium-google/.